Pantone Metallics Guides and Chips books contain over 600 metallic colours that are not included in the standard range of Pantone Colour Charts. Pantone metallic colours are split into two sets, Metallics and Premium Metallics. The Pantone Metallics guide has an expansive palette of 301 exquisite metallic Pantone colours that add impact and elegance to any project. 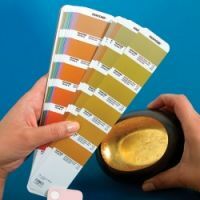 Whilst the Pantone Premium Metallics chart is a colour book of 300 dazzling metallic colours developed in response to the rapidly rising popularity of special-effect inks. Pantone Premium Metallic colours have greater brilliance than normal metallics and can be easily coated with no loss in luster. They also have a longer life after printing. Both guides are chromatically arranged, printed on coated stock and include Ink formulations. Pantone Metallics and Pantone Premium Metallics charts are available as a money saving two book set that comes with a free download of the Pantone Colour Manager Software, upon product registration.